New Delhi: We are at Delhi’s oldest surviving nahari shop—Haji Shiroo’s in Old Delhi. I’m with Kaushik Ramaswamy, a photographer who’s been on a research trail on Delhi’s classic eateries for the last three months. Ramaswamy, 32, with Tamil, Sikh and Bengali Muslim grandparents, grew up with diverse culinary experiences. His ambitious body of work is driven by a love for food and a scholarly interest in his native city’s historical turns. 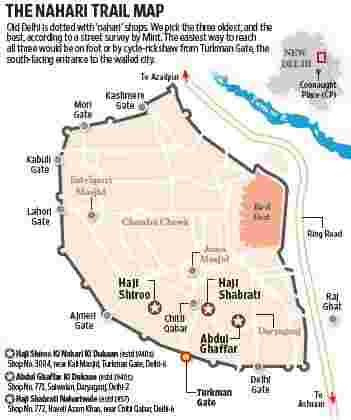 The 20-minute ride from New Delhi’s commercial heart, Connaught Place, to here has taken us 400 years back in time. We’ve navigated the narrow lanes of the Mughal empire’s 17th century capital city on an Enfield, and reached just in time to meet Chiraguddin, Haji Shiroo’s grandson, before he dashes off for his evening maghrib prayers. It’s the last week of the holy month of Ramzan, and in this part of the city, with its predominantly Muslim population, the observance of Ramzan customs is more pronounced than anywhere else. Soon, the façade of the historic eatery will be obscured by scores of Ramzan observers who will break their day-long fast with the spiced beef stew, made of buffalo meat. The bread makers, or naanbhais, work furiously to prepare for this—kneading flour into dough in one corner of the modest space. On the other side of the shop, dressed in a kurta and lungi, Chiraguddin sits on a raised platform that serves as an oven for the 40-litre copper pot that the beef shanks, onion and 24 assorted spices have been cooking in for eight hours. The spices come from the nearby Khari Baoli, Asia’s largest wholesale spice market, and are freshly ground every morning. Chiraguddin serves the stew straight from this cooking pot to a young boy who comes in with a steel bowl and asks for a serving of Rs20 to take away. Nahari is measured by the ladle and portions usually sell for anywhere between Rs20 and Rs2,000. Over the serving, he pours a spoonful of bright red rogan—oil that onions have been caramelized in. He then garnishes the dish with shredded ginger and finely chopped green chillies. Nahari was originally consumed as a breakfast meal and traces its origin to the Urdu word nahar for morning. Today, it is mostly had in the evening. During Ramzan, however, several shops such as Haji Shiroo’s make it available in the morning as well in order to accommodate Islamic fasting norms. Ramaswamy says that though the origin of nahari dates back to the 1650s, Delhi’s oldest surviving nahari shop is not that old. The entire fabric of the city, including its eateries, was torn apart during the partition of 1947. Overnight, along with large chunks of its Muslim population, the city’s traditional eateries also vanished. Haji Shiroo resisted the move to Pakistan. Coming from a long line of caterers, he had set up the shop in the mid-1940s ahead of the subcontinent’s partition. Chiraguddin isn’t aware of the precise date, but insists that his shop is the oldest surviving one, a belief that is corroborated by every passer-by we meet. Over time, Haji Shiroo’s shop has served as a cradle for new culinary talent; a teething ground for nahari exponents. If a student did well, he moved out and after making a few changes to the recipe, he started his own shop. Abdul Ghaffar was one such enterprising student. Today, Ghaffar Ki Dukaan is run by his grandson Mohammad Shahid and is a legendary food stop in its own right. Ramaswamy’s research shows that over the 1950s and 1960s, nahari shops re-established themselves rapidly. Today, each kucha (a collection of gated neighbourhoods) in Old Delhi has its own shop. However, some such as Haji Shabrati Nahariwale have achieved greater fame, and claim to have clients from as far as Canada and Dubai who take away iced boxes of the delicacy to savour overseas. The shop is run by yet another third-generation entrepreneur—Mohammad Shuaib Ilyas. Ilyas claims that even though nahari shops are present in Pakistan and other parts of the Muslim world, they’ve all been founded by nahari cooks who migrated from Delhi. Over a nahari meal, we ask Ilyas to pick from one of the many stories floating on the dish’s origin. Ilyas is convinced about the veracity of his own version: In the mid-1600s, soon after the Mughal emperor Shahjahan established the capital city of Shahjahanabad (Old Delhi), a major flu swept through the city, striking many including the emperor himself. The royal physician devised nahari, a spicy recipe to clear blocked sinuses, as an all-purpose remedy to keep the body warm. Overnight cooking was a way to kill the germs in Delhi’s contaminated water lines. As Muslim ascendancy and power declined, nahari had an image makeover from being upper-class fare to the common man’s food. But it has been around in some form or the other. The fact that Old Delhi natives observing fasts during Ramzan feel compelled to have nahari a few times a week at least is testimony to its strong link with Islamic history and tradition in India. From the general spiels on commercialization, one would think that these modest shops would have been hit hard by the bourgeoning number of restaurants and fast food chains in the city. But surprisingly, their clientele has remained loyal, and has even expanded. Ilyas says the number of nahari shops has grown from three in the 1950s to around 200 that dot the precincts of the walled city and its neighbouring areas today. Go, dip into four centuries of history with a piece of bread.